Nynas 40/60 is a paving grade bitumen and is produced according to EN 12591. The road was refurbished and paved with asphalt. Refurbishment of the road involved removing a 200mm thick layer of concrete, carrying out cement stabilisation to large areas of the existing sub-base and installing a high performance layer of asphalt comprising GAB II, ABB and SMA with a stone size of 11mm. The asphalt material was bound together with the Nynas 40/60 binder and, as a result, an additional Nordic concrete pavement turned black. 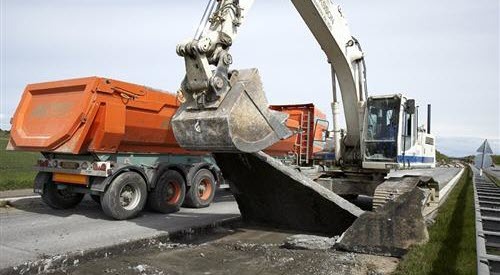 Specialist cement stabilisation company Inreco A/S was commissioned by the main contractor MJ Eriksson to treat around 45,000m2 of the 60,000m2 of road surface area covered by the contract. The sub-base of the northern most end of the contract had remained intact, but partial cement stabilisation was carried out elsewhere due to failures in the existing sub-base. Cement stabilisation work proved to be a challenge because the sub-base consisted of a very fine grainy sand. The sub base was leveled with a large grader machine that was controlled by two satellites, before cement was spread using another piece of machinery. A stabilisation machine was then used to ground the cement down. Water was added before the surface was rolled, compressed and sealed with a layer of emulsion. Director of Inreco A/S Niels Kristoffersen says: "All the work was carried out at night to avoid excessive evaporation in the warm Danish summer weather." NCC Roads then supplied and laid around 36,000t of new asphalt on the road. Regional manager Anders Kargo, who is responsible for asphalt for NCC Region Øst says: "Having seen the old concrete road, which was full of cracks and very uneven, it is a delight to see the refurbished lanes, which are now as smooth as a billiard table." One of the benefits of refurbishing a road in this way is that the new asphalt surface is completely smooth and a pleasure for motorists to drive on. "I believe there is no doubt that motorists who use this road will notice a distinct improvement in terms of comfort. The road will probably also be a lot quieter than it has been in the past," Mr Kargo adds. The cost of refurbishing the two southbound lanes of the E47/E20 (which is also known as the E55) is around 35M kroner. This works out to around 5M kroner per kilometre of cement-stabilised motorway. No work was carried out on the existing hard shoulders. Compare this with the cost of constructing new motorway in Denmark. In open country, a new road typically costs between 20 and 50M kroner per kilometre. In more built up areas, the cost can easily rise to between 60 and 80M kroner per kilometre. Similar cement stabilisation treatment and asphalt surfacing are set to be carried out on the northbound carriageway of the 7km stretch of the motorway soon. When complete, Denmark's 'Big H' motorway network will then largely be covered by a layer of asphalt. Denmark's 'Big H' motorway network was first considered by a report in 1936 and a big debate on construction of the scheme followed. The 'Big H' was to comprise a series of connecting motorways between Helsingør and Rødby, Copenhagen and Fredericia and Frøslev and Frederikshavn. Construction of the 'Big H' began in 1954 and was completed in 1998 with the opening of a bridge over the Great Belt. The 'Big H' now has spurs to Hirtshals, Esbjerg, Silkeborg-Herning and a number of branches in the Greater Copenhagen area. A motorway bridge link to Sweden over the Øresund and a forthcoming fixed link across the Fehmarn Belt to Germany are creating closer ties between Denmark, Scandinavia and continental Europe. Download this information on how Nynas 40/60 was used at E47/E20, Falster, Danmark, as pdf.